When capitalism is clearly catastrophically out of control and its excesses cannot be sustained socially or ecologically, the ideas of Herbert Marcuse become as relevant as they were in the 1960s. This is the first English introduction to Marcuse to be published for decades, and deals specifically with his aesthetic theories and their relation to a critical theory of society. 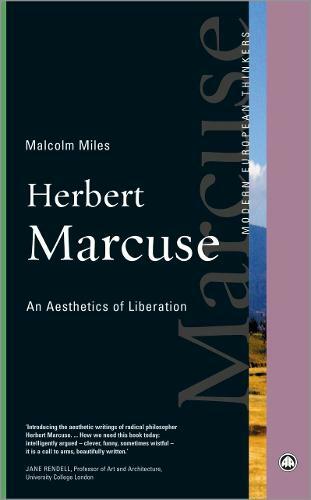 Although Marcuse is best known as a critic of consumer society, epitomised in the classic One-Dimensional Man, Malcolm Miles provides an insight into how Marcuse's aesthetic theories evolved within his broader attitudes, from his anxiety at the rise of fascism in the 1930s through heady optimism of the 1960s, to acceptance in the 1970s that radical art becomes an invaluable progressive force when political change has become deadlocked. Marcuse's aesthetics of liberation, in which art assumes a primary role in interrupting the operation of capitalism, made him a key figure for the student movement in the 1960s. As diverse forms of resistance rise once more, a new generation of students, scholars and activists will find Marcuse's radical theory essential to their struggle. 'Goes back to Marcuse's work on aesthetics to link philosophy, art, history, political analysis, and sociological insights in a deeply humane search for the way to a better world. It deserves a very wide readership' -- Peter Marcuse (with obvious bias). 'Introducing the aesthetic writings of radical philosopher Herbert Marcuse, cultural theorist Malcolm Miles explores the role the imagination plays for Marcuse in political transformation, offering us the hope of a horizon to neoliberal capitalism's treachery' -- Jane Rendell, Professor and Vice Dean of Research, The Bartlett, UCL, and author of Site-Writing (2010), Art and Architecture (2006) and The Pursuit of Pleasure (2002).